UK anglers Keiron and Julia continued their Thailand fishing holiday with a second session at IT Lake Monsters carp and predator fishing. On arrival at the carp and predator fishing lake the anglers both set up a carp fishing rod each and baited a large marginal area with local groundbait. The anglers having baited at the end of the previous day simply cast their carp feeders onto the baited area and waited for further developments. After almost an hour of inactivity one of the carp rods burst into life as line was quickly stripped from the reel. Winding down into the fish saw the rod loop over and a large bow wave appear over the baited area. As the carp rapidly departed the baited area Keiron held on tight as the line quickly cut through the surface of the water. The unseen carp charged up and down the margins and then kited on a long line in the centre of the lake where it chugged around fro several minutes. Slowly the angler regained line back onto the reel as the carp was brought closer and closer to the waiting landing net. With the carp still several yards from the landing net it dramatically surfaced to reveal a stunning Giant Siamese Carp of big proportions. Keiron carefully brought the Giant Siamese Carp to the waiting net where it was expertly scooped up by the guide. 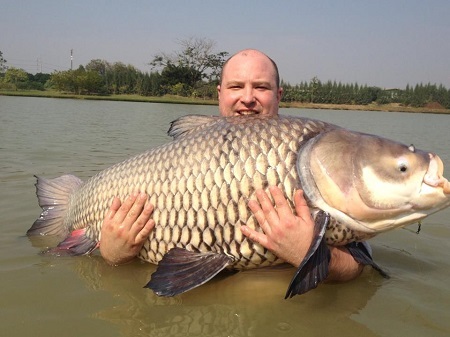 The Giant Siamese Carp was estimated to weigh in the excess of 45kg’s and was proudly displayed by the angler. 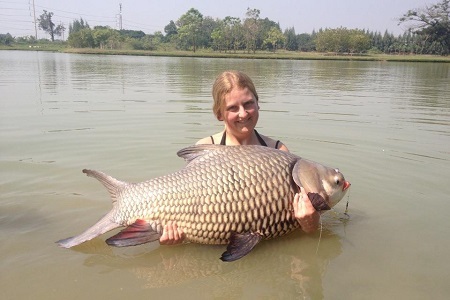 Julia was not long in following up the capture of the monster Giant Siamese Carp with one of her own which followed just over an hour after the last fish. The Giant Siamese Carp on this occasion was estimated to weigh slightly less possibly approaching the 40kg mark on this occasion. After all the excitement of catching the Giant Siamese carp the anglers changed over to deadbait for the afternoon and were soon hauling predators on literally one every cast. Kerion and Julia caught steadily throughout the afternoon landing Arapaima, Alligator Gar, a large amount of Redtail Catfish, Sorubim, Giant Snakehead and even a Giant Gourami during the days predator fishing in Thailand bringing the total of fish caught in their three day Thailand fishing holiday ti be very close to one hundred fish. A truly amazing capture by two very capable anglers showing how incredible Thailand fishing can be on its given day. 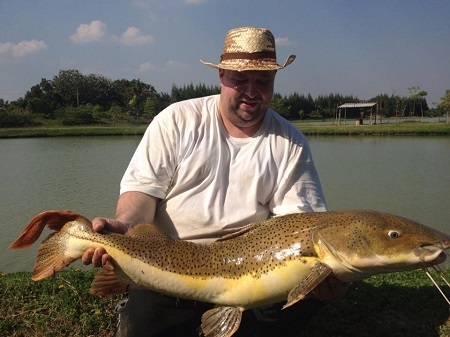 After all of the excitement the anglers returned to Bangkok and continued their Thailand holiday with some much need relaxation and sight seeing after all the carp and predator fishing.